I've recently been addicted to the game Antiyoy on Android. The game has an odd name, but it's a simplistic turn based strategy game. I have no idea what Antiyoy is an abbreviation for, nor do I know how to pronounce it. It's very similar to another game called Slay. The first few levels are easy, but the instructions on how to play are a bit sparse. However, as I advanced through the levels, I found that depending on the level, different strategies can be deployed to win. And all the levels are very winnable. I like that the game doesn't require internet, so it can be played anywhere. The game also doesn't use much battery, as the graphics are fairly basic, but easily distinguishable. Tiles on the game are hexagonal (6 sided), can be owned by a player, and can have buildings or trees on them. There are two types of tree: pine trees or palm trees. Palm trees spread faster than pine trees. The units not only protect the tile they occupy, but also the adjacent territories. All units can move across 4 owned tiles. Huts must be connected to existing huts or town halls. Towers and Magic Towers can be built on any territory you own. Units can be combined to form stronger units, but cannot be disbanded to smaller units. Towers can be upgraded to stronger towers. Each contiguous territory has their own total coin count. The coin count for sections that become connected are added together to one lump sum. The most important aspect to mastering Antiyoy is knowing the which units are effective against which buildings while attacking, and which buildings and units are good for defending your space. Now that I've beaten all 105 levels out of the 105 available (more levels may have been create in future Antiyoy updates), I feel I've got a decent handle on the game and the various strategies that can be used to win any level in Antiyoy. You may need to analyze the map determine which tactic is best suited. The economy drives everything. If you have a strong economy, you can better defend your space. If your enemy has a strong economy, then they can more efficiently increase their land. The best way to increase you economy is to build huts. Note that each additional hut will cost more. 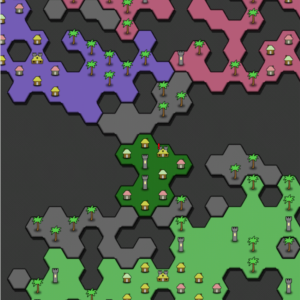 If your territories are split in multiple pieces, build up your huts in each of the territories and connect them at the last possible moment. You will get a better deal on your huts than if your entire space were connected. When attack the enemy, your best bet is to divide and conquer open tiles that don't have huts. If you attack an enemy section with many huts, focus on destroying huts to destroy their economy. It will take a lot longer for your enemy to rebuild their huts. If you have to, continue hiring peasants or spearmen to take down buildings, even if it means you might lose them the next round. Control choke points with Magic Towers. Control nearby choke points with magic towers, but keep a Knight nearby to repel intruders. You should try to own the tiles around magic towers. This way, your enemy will need two Knights to destroy your Magic tower. Attack tiles that when there is only one secluded enemy hexagon, the area doesn't generate any income for your enemy. A single owned tile with no adjacently owned tiles will have any huts or town halls automatically removed, making it easier to cleanup with a peasant in the next round. Sometimes, its better to guard the small space you own and fill the spaces up with huts to improve your economy. You don't always have to make a move with your units. Sometimes, it's better to let your enemies fight it while you build up your huts and economy. Focus on one enemy to destroy at a time. Therefore, it is critical to make sure that you don't leave an enemy without a third enemy. Otherwise, that enemy will be at your doorstop in no time! You can lock down your color in the settings. This makes visualizing the game ever slightly easier. Towers can only be destroyed by the enemy. Therefore, make sure you build a Magic Tower only where you need it. Otherwise, Magic towers in very safe areas is a waste of upkeep (-6 coins) versus a standard tower which has a much lower upkeep (-1 coin). When building huts, avoid blocking your route for your troops to get through. Each unit can move 4 owned tiles per turn. Some maps may start in a way that doesn't allow additional huts to be built, likely blocked by towers. The trick here is to let expand out, and let the enemy break your owned tiles up into two different territories. Each territory will get its own Town Hall, which can be a starting point for huts.